Colombia and FARC rebels agree to historic peace deal after 50 years of war. 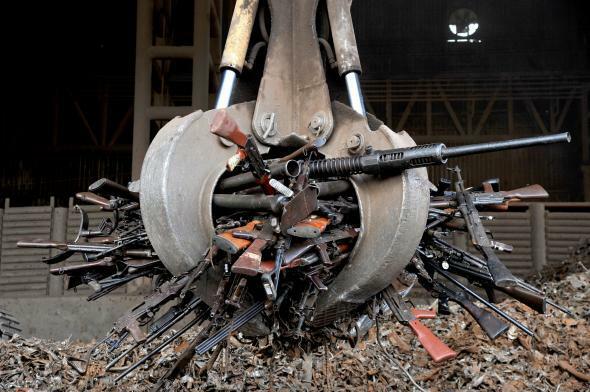 A crane carrying weapons seized from the FARC and others in November 2014 in Sogamoso, Boyaca department, Colombia. After more than 50 years of war and four years of negotiation, the Colombian government and the FARC rebels agreed to a final, historic peace deal in Havana on Wednesday. The agreement signals the end of a violent, scarring conflict that began in 1964, resulted in the death of 220,000, and displaced millions more, touching virtually every corner of Colombian society. During the past half-century, the Marxist guerrilla group became one of the world’s biggest cocaine traffickers and terrorized Colombians caught in the conflict’s crossfire. The deal brings to a close a final push of negotiation, but there are still hurdles that stand in the way of implementing the agreement. The Colombian Congress first has to approve an amnesty provision for FARC fighters; the agreement will then be put before the Colombian people in a referendum expected to be held in October. Despite the potential end of Latin America’s longest conflict, it is not assured that voters will approve the measure. The political agreement is fraught with its own constituencies of those impacted by the violence, many of whom are not happy with members of a brutal guerrilla force, labeled a terrorist organization by the U.S. State Department, avoiding jail time. Colombian President Juan Manuel Santos is an advocate for the settlement, but there remain powerful opponents of the deal, including former president Sen. Álvaro Uribe. The deal includes agreements on rural development, political participation for a demobilised Farc, and fighting illegal drug crops and narco-trafficking, which has been a major source of funding for the rebels. It also sets up a transitional justice system for crimes committed during the conflict, which will allow Farc members who confess their crimes to avoid serving their sentences in jail. Public opinion polls currently show opinion in the country split over whether to approve the deal, according to the Guardian.